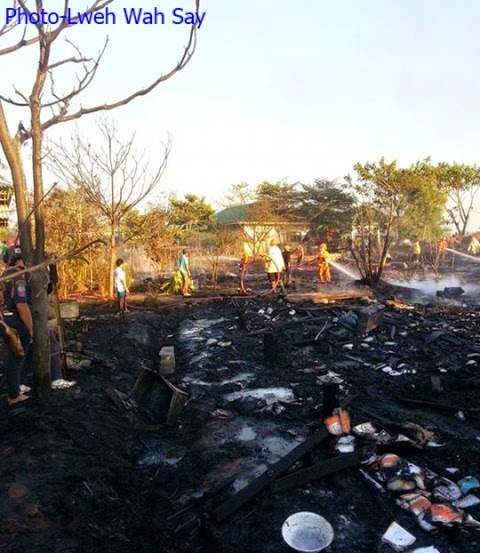 Four boarding houses of the Children Development Center (CDC), a migrant school on the Thai border town of Mae Sot, burnt to the ground on Wednesday, February 25, leaving homeless 62 male students who were living and studying at the school. Saw Elijah, administrator of the boarding house spoke to Karen News. Four fire trucks from Mae Sot’s municipal arrived to the fire and stopped it at around 6pm. The fire injured two students living at the boarding houses. The sugar cane plantation where the fire started is only separated from the school and boarding house by a concrete wall. The hot dry weather combined with the boarding house leaf roofing, bamboo walls and wooden poles, the fire caught and spread quickly. Teachers said it was fortunate that there were only a few students at the boarding house when the fire started. The students tried to fight the fire but were beaten back by the flames and could only watch as fire spread. Mahn Shwe Nin, headmaster of the CDC school spoke to Karen News about the current condition of the students. The fire destroyed four buildings, clothes and uniforms, personal belongings, pots and plates of the boarding students and they now need emergency assistance. The Thai authorities are investigating the fire. The CDC school boarding houses were built in 2012. The CDC school provides education for children from the Mae Sot migrant community as well as children from rural communities in Burma.